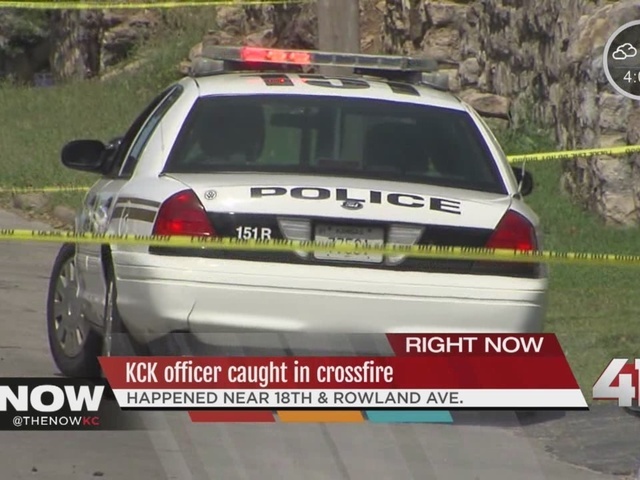 A Kansas City, Kan., police car was caught in gunfire between two other vehicles near 18th Street and Rowland on Monday afternoon. 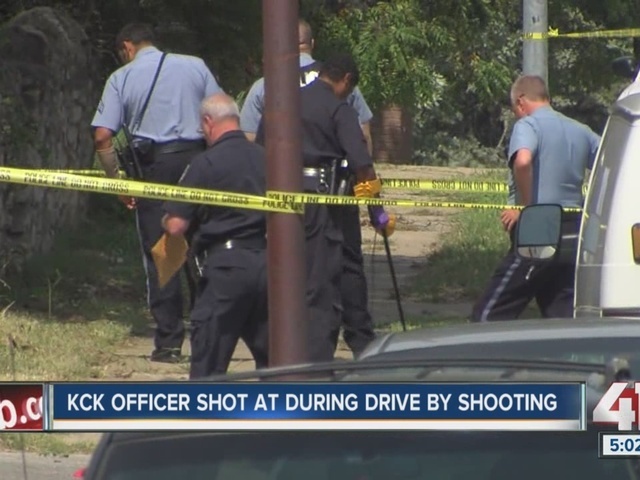 According to a news release from KCK police, an officer observed a small, black, four-door vehicle driving northbound on 18th Street with the front passenger sitting outside of the vehicle leaning across the roof of the car. When the officer tried to engage the car and pull them over, the driver ignored the officer and kept going. The black car turned westbound down Rowland Avenue and came across a teal Pontiac Grand Prix, and gunfire ensued between the two vehicles while the police car was between them, according to the news release. Originally KCK police reported shots were fired at an officer. The police car was not hit, and the two vehicles fled the scene. The officer was not injured. "There was a cop coming down the street," Thomas Duff, who lives in the neighborhood, said. "Next thing I know, I hear five or six shots, car speeds off on the curb. He turns his sirens and lights and seeds off the side streets." Police said at this time they are looking for a small black four door vehicle and a 2000 model Pontiac Grand Prix, teal in color with dark tinted windows, missing side mirror and possible bullet holes on the driver’s side. Note, the vehicle pictured is not the actual suspect vehicle. This incident remains under investigation. Anyone with information in the incident is asked to call the TIPS Hotline at 816-474-8477.